necklaces) and most of it is Sterling Silver at very affordable prices. I chose three items from their website that I loved. First up is the Wishbone Pendant and chain*. For some reason it symbolises wishes to me - who would have thought?! Ok sorry I had to add a little jokey sarcasm there haha. I actually really like the thought behind it and haven't really seen necklaces like this around. I feel quite unique wearing it. I was very attracted to the bracelets on the website. Out of all types of jewellery to wear, bracelets are my fave. I chose the Sterling Silver Stretchy Beaded Heart Charm Bracelet*. I think it was the first thing I spotted on the website and I was like "I have to have that!" and it's actually one of the most expensive pieces on there, but still very much affordable (£22). I have to say it looks a lot more pricey then it actually is and fits pleasingly on my arm. Going along with the "spiritual" vibe of the wishbone necklace, I chose the Fine Sterling Silver Star Belcher Chain Bracelet*. At an amazing £4.15!!!!! I had to have it. This again looks more expensive than it is, it's one of those bracelets I like to keep on. Overall I am just so excited to be sharing this website with you. I only share items I really like on my blog and this company has really impressed me! The fact you can get sterling silver jewellery at such excellent prices (Great for gifts as well). Have you heard of this website? These jewels are so pretty! I recently worked with them too, loved their pieces! I love the wishbone necklace! I haven't heard of Jewellery Box before but their jewellery looks so cute. 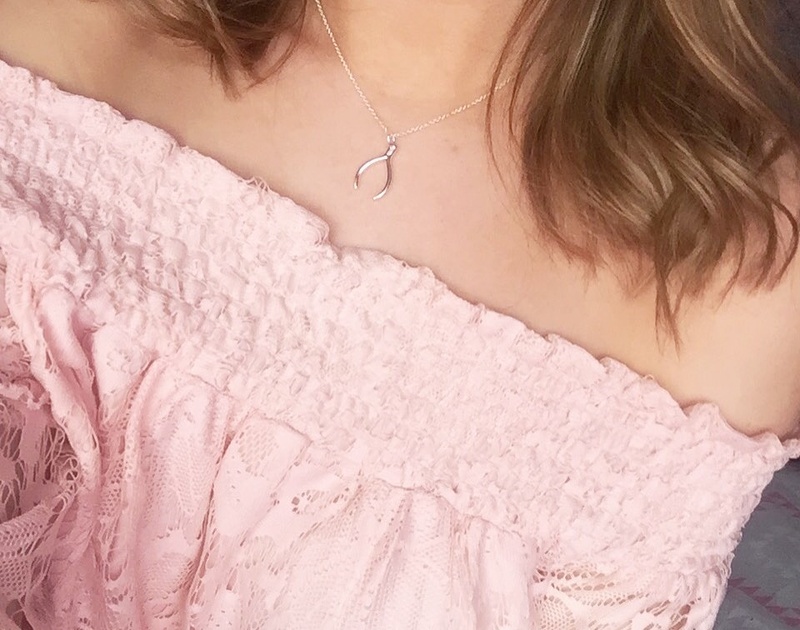 The necklace is so pretty, I love how dainty it looks! The jewellery is too cute!! Love them! I love the jewelry you are wearing, it's so dainty and pretty.